Acupuncture is an ancient tradition that originated in China at least three thousand years ago. The origins of the practice are enshrouded in mystery, but it seems to have been first applied to both people and large animals (especially horses). In recent decades, it has also been applied to other animal species. Acupuncture involves the insertion of very thin needles through the skin, which are then left in place for a short time. This may seem like a torturous procedure, but in truth, many animals enjoy the process—and it’s quite common for a dog or cat to fall asleep or into a trance during treatment! Exactly how acupuncture “works” is complex, and is understood slightly differently from one medical model to another (i.e., western science vs. traditional Chinese medicine). In essence, though, needles are inserted at specific points along the body known to exert certain local or body-wide influences. From a Chinese perspective, these locations are placed along one of fourteen channels, or meridians, and affect the body in a variety of ways. From a western perspective, acupuncture points are generally quite enriched with nerve endings, and needle stimulation has been shown to alter nerve function, with both local and body-wide effects documented as a result. The most common problems that acupuncture is used for are those that involve pain or neurologic/nerve dysfunction, but as acupuncture’s effects are body-wide, a great variety of other medical and behavioral issues can benefit from needles as well. 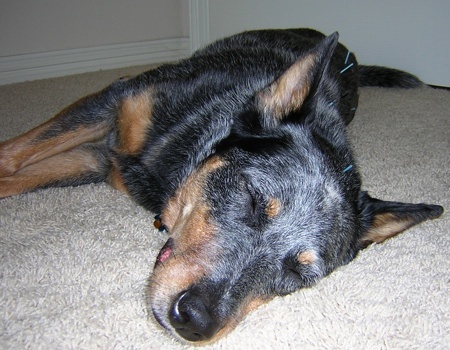 If you are interested in finding out more about acupuncture, or want to know if it could be useful for your pet, contact us. We’d be happy to talk to you. Visit the Healing Path Animal Wellness blog for quick tips and info on holistic animal care, behavior and nutrition. Visit our Facebook page and follow us.